Thank you for your interest in our unique cabin kits. Our business was started as a way to provide an affordable shelter option that encourages simple, low-impact living, in tune with the character of nature. PROCESS: Contact us to discuss custom options, delivery time frame, cost, and if you’d like to visit our model cabin. Determine if assistance will be needed for assembly, finish work or permitting. A simple contract is drawn and 25% deposited to initiate the building process. PRICING: Basic 20' cabin kit pricing starts at $17,000, plus shipping if delivered outside the Monterey Bay region. Engineer stamped plans can be provided for the structure above foundation level. Site specific foundation engineering is also available. CABIN KIT: Basic kit provides the engineered shell of the building, with fully panelized wall and roof systems, finished exterior siding and finished interior ceiling. It includes eight wall panels, eight roof panels, pre-cut metal roof package, exterior trim, hardware and roofing paper for immediate waterproofing. All wood is unfinished. Interior walls are provided open to allow for insulation, electrical or plumbing work. Each cabin can be highly customized to your order. Kit does not include doors, windows, insulation, floor framing or foundation. Cost to finish kit following assembly varies depending on detailing and materials chosen. Custom finished turn-key insulated cabins can cost as little as $120 per square foot. We are available for hire to assemble and finish kits in the Monterey Bay region. SPECIFICATIONS: Cabin floor plan is approximately 20' in diameter and octagonal in shape, providing 288 square feet of floor space with standard 7'8" wall height. Walls are Douglas fir framed panels, clad with T1-11 siding. Roof framing is redwood or fir 2x6 with pine tongue-and-groove planking. Cabin is engineered as International Residential Code (IRC) compliant, with identical structural integrity as conventional wood-framed housing. CUSTOM OPTIONS: Custom options are available for exterior siding and interior ceiling treatments. Real redwood siding is a favorite siding upgrade. 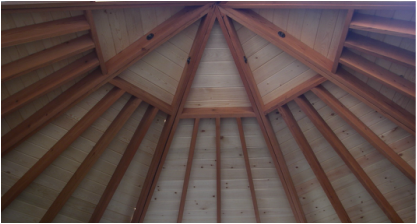 Standard ceiling is available in smooth or rough knotty pine, or a custom option of your choice. Ten foot tall walls are possible to allow for the addition of a loft. All door and window openings are custom sized and can be added to five of eight walls. Electrical work, plumbing, decking, cabinetry, insulation and other features can be added on site as desired. Cabin can be built plywood free if desired. Room additions are possible for bathroom, storage or kitchen. The open interior floor plan can be divided and finished to match any lifestyle, the exterior can be finished to match any architectural style. SHIPPING/DELIVERY: Delivery is by truck. Insured shipping outside the state of California is the responsibility of the buyer. ASSEMBLY: Assembly instructions are included with cabin kit. Kit assembly is typically completed in one day with a crew of four, depending on site conditions. Phone consultation can be made available during assembly. The services of a building contractor may be needed for foundation work, assembly and finishing of your cabin. We recommend that a skilled builder install doors, windows, and roofing. We are available for hire to assemble and finish kits in the Monterey Bay region. We offer custom foundation engineering and architectural services as needed. FOUNDATION: Poured concrete pier foundation is recommended. Eight inch or larger wood poles, post and pier, or concrete slab can also be used. Phone consultation is available for help with foundation arrangement. A light-weight semi-permanent foundation can be used on flat grade in many cases. MAINTENANCE AND LIFESPAN: These cabins have an expected lifespan of well over 50 years when properly maintained. Please ask for maintenance recommendations.